Image courtesy of LaBeouf, Rönkkö & Turner. How can artists create works of computer art or Internet art in which audience members become genuine artists and collaborate with the original artists on the self-same work that they began? To answer this question, this essay will reflect on the work of philosophers who focus on questions concerning art completion and the ontology of computer art. This essay will also reflect on the artistic work of the trio LaBeouf, Rönkkö & Turner, whose artwork can serve as a model for creating collaborative, digital art. KEYWORDS: Philosophy of Art; Computer Art; Internet Art; Remix; Art Completion; Interactive Art. Consider works of interactive computer art and Internet art, and the relations between their artists and audiences. Suppose that audience members, while interacting with such artwork, create brand new content. I will argue that when they do, the audience members sometimes, but not always, become artists themselves, and work in collaboration with the original artists. Pierre Levy claims that, when we reflect on some Internet artworks, “the established difference between author and reader, performer and spectator, creator and interpreter become blurred” (1996, 366). He writes that it is not fitting to draw sharp distinctions between these artworks’ authors and their audiences, insofar as this art “places us in a creative cycle, in a living environment in which we are always already co-authors” (ibid., 367). Similarly, Myron Krueger describes interactive computer artworks which are “dependent on a collaboration amongst the artist, the computer, and the participant” (1991, xii-xiii). Roy Ascott suggests that in some interactive, digital art “meaning is the product of interaction between the observer and the system” (1990, 241). He claims that “creativity is shared” and “authorship is distributed” (ibid., 243) between artists and audiences. Consider the proposition that I, myself, am an artist and desire to create and publish a work of computer art or Internet art in which audience members become genuine artists, themselves, collaborating with me and contributing to the self-same work that I began. What do I need to do, to make a work of art like this? That is the question I will consider here. I will discuss the intentions I would need to have, the decisions I would need to make, and what the work of art would need to be like. I will need to address philosophical questions. It is only by considering the theories of philosophers of art that I can determine how best to create the kind of artwork I desire. In particular, I will need to reflect on the necessary and/or sufficient conditions of art completion, as discussed by philosophers such as Darren Hudson Hick, Paisley Livingston, Carol Archer and Kelly Trogdon. I will also need to reflect on the ontology of computer art, explored by philosophers such as Dominic McIver Lopes and Dominic Preston. Finally, I will need to relate the notion of digital collaboration to the domains of art completion and the ontology of computer art. Before I turn to the work of these philosophers, I will first briefly explore the artistic work of a trio of artists, Shia LaBeouf, Nastja Säde Rönkkö and Luke Turner, who go by the band name “LaBeouf, Rönkkö & Turner.” It is possible that this trio has already created the kind of artwork I desire to create myself. But even if they have not, their work can nonetheless serve as a valuable model for developing that kind of artwork. From top to bottom: Original “Just Do It” film with green-screen; Damn It Shia (remix); Shia LaBeouf's Motivational Speech: LOTR Edition (remix); JUST DO IT!!! ft. Shia LaBeouf - Songify This (remix); and “Just Do It” Shia Labeouf motivational video ft. Mace Coronel (remix). LaBeouf, Rönkkö & Turner prefaced a 2015 art project titled #INTRODUCTIONS by requesting that students at Central Saint Martins write short scripts for LaBeouf to perform in front of a green-screen. Once the green-screen video was made, those students were encouraged to fill the green screen with whatever images, video, or effects they had in mind. 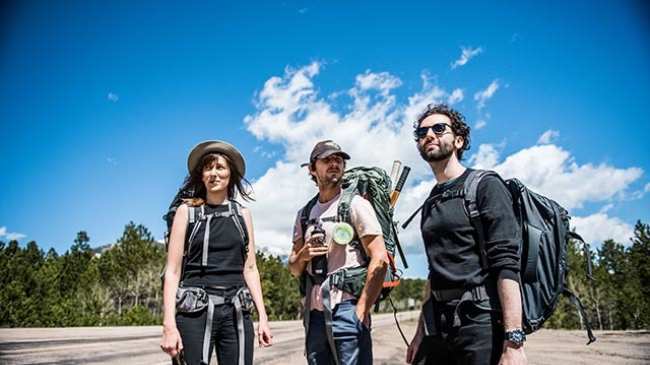 LaBeouf, Rönkkö & Turner also posted the green-screen video on the Internet with a Creative Commons License giving their Internet audience permission to add content to the video and post remixes online. YouTubers subsequently created hundreds of remixes based on #INTRODUCTIONS, most building on a one-minute clip, which had been excerpted from #INTRODUCTIONS, called the “Motivational Speech” video.1 Many of these remixes, which substantially and creatively change the original green-screen video, can still be found on YouTube. In light of the work of theorists who focus on digital remix, such as Vito Campanelli, John Logie, and Rachel Falconer, #INTRODUCTIONS seems like a particularly good candidate for a work of art in which audience members become artists themselves and collaborate with the original artists to finish a work which those artists began. For example, Campanelli claims that “in remix culture a work is never completed, it functions rather as a relay that is passed to others so that they can contribute to the process” (Campanelli 2014, 69). Might we conceive of LaBeouf, Rönkkö & Turner’s green-screen video as an incomplete work, which function as a relay so that remixers can contribute? Logie, who also focuses on remix, claims that digital strategies “dramatically complicate the task of ascribing authorship” (Logie 2014, 296). He writes that remixes often involve “distributed collaborative composition” between a variety of creators, some of whom might never meet each other (Logie 2014, 304-307). Might we likewise think of the #INTRODUCTIONS YouTube remixes as involving distributed collaborative composition between LaBeouf, Rönkkö, Turner, and the YouTube remixers? Falconer contends that we might rightly view some content created on the Internet, including some remixes, as the product of a “hive mind” composed of many individuals (Falconer 398 & 404). Might we think of LaBeouf, Rönkkö, Turner, and their remixers as together forming a single hive mind? Some of the #INTRODUCTIONS audience members, namely the remixers, copied content which already exists, namely parts of the green-screen video, but also created new, original content over and beyond it.2 Does this mix of unoriginal copying and original-content creating enable the remixers to collaborate with the original trio of artists, whom they never met, to finish the self-same work of art which that trio began? LaBeouf, Rönkkö & Turner’s 2016 art project titled #TAKEMEANYWHERE is a clearer example of an interactive artwork in which audience members contribute directly to the completion of the artwork. At the start of this project, the three artists posted a note online reading: “FROM 23 MAY UNTIL 23 JUNE 2016 YOU ARE INVITED TO PICK UP THE ARTISTS WHENEVER THEIR COORDINATES ARE POSTED ABOVE AND TAKE THEM ANYWHERE.” The artists also posted their first set of GPS coordinates where they could be found. Then they waited until strangers, who has seen their coordinates online, picked them up in their cars and took them wherever those strangers chose. 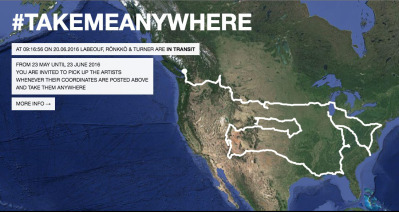 The project was tracked in real time on the website http://takemeanywhere.vice.com, where the project’s audience could find a map in which a small dot, representing the artists, moved slowly across the country. As the artists hitchhiked, they traveled through Colorado, Kansas, and Arizona, across the country to Florida, north to Pennsylvania, and then west to Washington State, before heading north into Canada. The driver-participants, who were the most active members of project’s audience, were well aware that the art project was not yet complete, and that they were participating in an artwork that was still ongoing. Further, those audience members’ decisions shaped the artistic project itself; they chose where the artists went. Might we say that the audience had some degree of authorial control? LaBeouf, Rönkkö & Turner see their artwork as involving an open collaboration with their audience. When asked what they think about their projects’ audience members, LaBeouf responded: “They’re collaborators . . . it’s theirs as much as it is ours. I think when you collaborate with the audience, you create a different kind of fan.” Rönkkö remarked: “I never really think of audience any more, it doesn’t feel like the right word.” Turner added: “Once the work is set up, I see myself as a participant in an equal way to the wider public who are participating in it” (De Wachter 2017, 217-220). Similarly, in an interview about #TAKEMEANYWHERE, Turner remarked that the artists were putting their trust “in the collective, in the networks – they’re deciding, they’re determining what unfolds.” Rönkkö remarked that “the whole thing is made possible via the internet, through the networks” (VICE Staff, 2016). These remarks are reminiscent of Tatiana Bazzichelli’s reflections on what she calls “the new role of the artist and author who becomes a networker, an operator of collective networks” (Bazzichelli 2006, 18). She claims that in the art of networking, “art becomes inter-action, inviting the spectator to eliminate the distance between himself and the artistic product, with the goal of making the dichotomy of artist-spectator obsolete” (ibid., 21). Have LaBeouf, Rönkkö & Turner already created the kind of art I desire to create – a work of art in which audience members become genuine artists, too, collaborating with the original artist and contributing to the self-same work the original artist began? So far, I have not provided any conclusive evidence, and I will continue to reflect on this question, periodically, below. That said, regardless of whether or not their artwork turns audience members into genuine artists and collaborators, the artwork of LaBeouf, Rönkkö & Turner provides an excellent model to start from, when trying to create art that achieves this goal. Below, I will attempt to determine what conditions must be met, in order to create the kind of artwork I desire. To do so, I will consider a number of philosophical questions. I will reflect on discussions concerning the ontology of computer art and the notion of art completion. I will turn away from focusing on LaBeouf, Rönkkö & Turner, and instead attend to broad, general concerns. Nonetheless, I will return to the work of LaBeouf, Rönkkö & Turner again, later, to explore how their work can serve as a model for the kind of artwork I desire. To create the kind of work that I want, in which audience members contribute to the self-same work that I began, my artwork would need to be incomplete at the time of its publication. Many philosophers agree that once an artwork is genuinely complete, any further artistic changes to it would result in a new, numerically-distinct work of art (Hick 2008, 71). Consider, for example, Marcel Duchamp’s 1919 work L.H.O.O.Q., for which Duchamp drew a mustache and beard on a postcard reproduction of Leonardo da Vinci’s Mona Lisa. Duchamp created a new work of art, rather than contributing to the Mona Lisa, itself. To put this another way, Duchamp did not collaborate with da Vinci in the creation of the original Mona Lisa. Likewise, if I create and publish a complete work of art, its audience members could not subsequently contribute to it, either. Instead, I desire to create an artwork such that my audience members will collaborate with me on the same work that I instigated. But just as Duchamp did not collaborate with da Vinci in the creation of the Mona Lisa, if I create a complete work of art, its audience members could not collaborate with me on that same artwork. I consider all individuals who contribute to the completion of the same work of art to be collaborators. No doubt, numerous individuals might contribute to the same work of art without engaging in dialogue with each other, and sometimes even without communicating at all. But even individuals who do not engage in dialogue could still be considered collaborators, in a weaker sense, if they all contribute to the same work of art. Each individual’s creative work would not stand in isolation; their creative efforts would relate in ways that they could not if they were working on numerically distinct artworks. The central point I want to express here is this: if I were to create a complete work of art, then its audience members would be unable to contribute to it, and thus they could not collaborate with me on it, either. Since I desire to create a work of art in which my audience members become collaborators, I must not create a complete work of art. So how can I create a work of computer art or Internet art that is published and yet nonetheless incomplete? Philosophers provide different, competing accounts of art completion. But suppose I create a work of art that meets each philosopher’s different conditions for a work remaining incomplete despite publication. Then, no matter which philosopher is correct, I would have created the kind of art I desire. Below I will briefly articulate a number of philosophers’ positions, in order to subsequently describe how to create the artwork I have in mind. I will focus on the theories of Hick, Beardsley, Livingston, Archer, and Trogdon. Like Hick, I will think of the act of publishing as “the act of making some work available to the public at large” (2008, 71). I will not focus on conditions for what Livingston calls “aesthetic completion.” That is, I will not consider what qualities a work must have to be complete in the sense that it is, in Beardsley’s words, “worthy of standing by itself, as an object of aesthetic enjoyment” (Beardsley 1965, 299). Instead, when I discuss the completion of artwork, I will focus on what Livingston calls “genetic completion.” We can consider works of art that we know are complete but which lack aesthetic completion, such as romantic fragments and other artworks deliberately crafted to resemble parts of missing, finished works (Livingston 2005, 54-55; Livingston 1999, 14-15). Such romantic fragments are genetically complete and finished, and are neither abandoned artworks nor works in progress, despite looking as if parts of their structures are missing. Below I will focus on this question: What conditions in the creative process are necessary or sufficient for any artwork to be genetically complete? My goal is to create a work of digital art that is genetically incomplete, so that its audience members could collaborate with me, change the work of art I began, and contribute to its completion. Livingston writes that “the decision to display or publish a work . . . is not always indicative of the work’s actual genetic completion” (2005, 58). Livingston, when writing without a co-author, insists that a work of art is complete “only if its maker or makers decide it is so” (2005, 55), provided the decision is not coerced (2008, 393). So if an artist does not decide that a work of art is complete, but publishes the work anyway, the artwork remains incomplete. According to Livingston, it is up to the artist to determine when his or her work is finished. It is not sufficient that an artist deliberately decide to stop creative work; when an artist gives up on a project out of frustration, she might not decide that it is finished and it might remain incomplete (Livingston 2005, 56; Livingston and Archer 2010, 443). That said, Livingston does suggest that often an artist will decide that a work is complete around roughly the same time that he decides to cease creative work on it, but Livingston also acknowledges that sometimes an artist will decide to cease creative work but only decide that a work is complete and finished later on. Livingston notes, for example, that the topiary ruins at Evalston Castle in Derbyshire were not finished when the artist ceased work, but instead when the shrubbery had grown to match the artist’s expectations (2005, 56; 1999, 16). In a co-authored essay, Livingston and Archer provide a similar account. They contend that “what makes a work complete is first and foremost the artist’s decision that it is so,” provided the decision is not coerced (Livingston and Archer 2010, 443 & 446). They claim that this is meant to be a necessary condition, rather than a sufficient one, insofar as some decisions might be indecisive, as when an artist, who had previously decided that an artwork is complete, suddenly decides to make a minor revision before revealing his work to the public. Rather, it is sufficient to render a work complete that the artist’s decision that the artwork is complete also terminates all further creative work and revision (ibid., 445). Livingston and Archer add that in some cases, the completion decision can have “an additional, forward-looking clause” (ibid., 446). Instead of deciding that a work is now finished, the artist can settle on a procedure that will determine when it is finished in the future. An artist might decide that a work will be finished by a certain time, regardless of what qualities it has by that point, as sometimes happens in timed writing competitions (ibid., 446; Livingston 1999, 16). Alternatively, collaborating artists might agree on a complicated process and decide that their work will be complete whenever that process’ conditions have been realized. As an example, Livingston and Archer describe the Surrealist practice of le cadavre exquis, in which each artist in a group makes contributions to a work without seeing what previous artists had contributed and without being aware of what further artists would add, having decided in advance that the work would be complete, regardless of its appearance, whenever the final artist in the group is finished (ibid., 449). Finally, as Livingston suggests on his own (2005, 58), Livingston and Archer also claim that “publication or public display” is neither necessary nor sufficient for a work to be complete, insofar as “work-in-progress can be put on display” (ibid., 444). Hick provides an alternative account of artistic completion, but again acknowledges that a work could be published without being complete. He considers but rejects the possibility that “publication of a work is a sufficient condition for that work’s being finished” (2008B, 72). He considers, for example, the case of an artist whose unfinished work is published without his consent, and cases in which an unfinished work is published after the artist’s death. Likewise, Hick leaves open the possibility that artists could publish an artwork that remains incomplete and unfinished, provided the artists include an explicit notice with their published work declaring that it remains incomplete. They might post a note such as “Draft: Not for Quotation” or “rehearsal performance of a theatrical work” (ibid., 74). Ultimately, Hick endorses the following sufficient condition for completion: “Provided no explicit declaration by the artist to the contrary, publication of a work with the artist’s consent is a sufficient condition of that work’s being finished” (ibid. ), with the additional proviso that the consent was not coerced (2008A, 397). Trogdon and Livingston together provide yet another account of completion, but also imply that a work could be published without being complete. They suggest that a work of art is complete provided the artist has acquired what they call a “completion disposition with respect to her work,” namely a disposition, grounded in the correct sort of cognitive mechanisms, not to make “significant changes to the work” (Trogdon and Livingston 2014, 227-228), were she, in likely scenarios, to consider the possibility of revision. Further, Trogdon and Livingston allow that a work could be complete, even if minor, comparatively insignificant editorial changes are subsequently made to it (ibid., 228). What are the correct sorts of cognitive mechanisms? They suggest that an artist must have “exercised her capacity to reason about art,” and this rational capacity might include beliefs about which properties have aesthetic value, a disposition to stop work on a project once aesthetic standards are achieved, the desire to work on a budget, etc. In contrast, if an artist acquires a disposition to cease work, but that disposition is grounded in the artist’s belief that the work is being abandoned as unfinished, then the work remains incomplete. And likewise, the work would also remain incomplete if the artist’s disposition was a result of coercion (ibid., 227-228). Based on their account, if a work of art were published, but the artist continued to treat it as a work in progress and had the disposition to continue to make significant changes, the work would nonetheless remain incomplete. And finally, Beardsley provides yet another account of artistic completion according to which a work could be published and yet remain incomplete. Beardsley does not clearly distinguish between “aesthetic” and “genetic” completion, and we might take him to imply that a work of art is truly finished only when its artist judges that it is aesthetically complete and “worthy of standing by itself” as a work of aesthetic appreciation (Beardsley 1965, 299).3 We might likewise say that a work is aesthetically complete, and so also is worthy of standing by itself, if it exhibits qualities such as coherence and resolution (Livingston 2005, 54; 1999, 14). If Beardsley’s account is correct, a published work might still be incomplete provided that its artist never judges it aesthetically complete like this. Recall that I desire to create a work of art that is incomplete at its time of publication, so that its audience members would be able to make changes to the self-same work of art I began and become artists of my artwork. Thus, I propose to create and publish a work of art without ever deciding that it is complete or believing that it is aesthetically complete. I propose to create and publish the work without acquiring a completion disposition that is grounded in the correct sort of cognitive mechanisms. Instead, I will intend to continue to add to my artwork even after its date of publication, and I will also intend for my audience members to work on it as artists as well. Additionally, I propose to create and publish a work of art that includes an explicit declaration that it is not yet finished. By creating and publishing a work like this, I will be sure to have published an incomplete artwork, no matter which philosopher discussed above is correct about completion conditions. Finally, to create a work of computer art or Internet art in which the audience members are themselves artists, I would need for my audience members to develop a certain, specific intention. Many philosophers agree that, to be an artist of an artwork, an individual would need to perform actions with the intention of creating that artwork (Lopes 2010, 72-74). So, to create a work of digital art like I desire, I would need to create a work in which my audience members intend to collaborate with me in finishing the work of art I began. So that my audience can generate the correct sorts of intentions, I propose to create a work of art with a note explicitly asking my audience members to collaborate with me, as artists, to finish the work of art. Returning to our earlier discussions, let us consider whether LaBeouf, Rönkkö & Turner’s projects are incomplete when their audiences first experience them. When it comes to #INTRODUCTIONS, the answer is not clear. I do not know for sure what decisions, dispositions, or intentions the artists had with respect to their green-screen video. Likewise, I do not know if the three artists’ public statements about their practices, together with the “emptiness” of the green-screen, are sufficient for philosophers such as Hick to consider them an explicit declaration that the green-screen video is an incomplete work of art on its own. The three artists certainly did not post a note with the work saying, “This work is incomplete.” Likewise, I do not know if the #INTRODUCTIONS YouTube remixers had the intention to create a work of art, or if they had the intention to work on the self-same work of art that LaBeouf, Rönkkö & Turner began. Certainly, a case could be made that #INTRODUCTIONS was incomplete when its audience first experiences it, but the argument would be tentative. What about the artists’ project, #TAKEMEANYWHERE? This artwork was not complete at the beginning of the artists’ journey. The journey, itself, was part of the artwork. At the start of #TAKEMEANYWHERE, the three artists explicitly declared when their journey would be complete – a month from when it began. Thus, the audience members who picked the artists up before that deadline and took them anywhere were aware they were participating in a project that was not yet complete. Those audience members could genuinely contribute to and change the self-same work which the artists began. They literally changed its direction (pun intended). In #TAKEMEANYWHERE, the driver-participants could transport the artists wherever they wanted, and so those driver-participants had control over many of the project’s details. Nonetheless, the three artists still shared some control of the overall artwork, insofar as they determined when the project would begin and end.4 At the beginning of their journey, LaBeouf, Rönkkö & Turner explicitly declared the date on which the journey would begin and end, thus establishing the project’s boundaries. Its audience could realize that it was participating in a finite project that the audience could help to complete. The driver-participants who transported the artists prior to the project’s completion deadline could all feel as if they were engaged in the same project, together – a common project that had not yet been completed. #TAKEMEANYWHERE could thus better contribute to a sense of community between its driver-participants.5 In fact, many of its driver-participants have chosen to seek each other out after the project commenced, and many have remained in touch as friends even years later. Likewise, I propose to create a work of art, myself, in which I will explicitly declare a final deadline on which the work will be complete, no matter what the work looks like at that time. That way, I will likewise set boundaries, share control, and create a project that allows many individuals to feel as if they are collaborating, together. David Z. Saltz writes that artists’ “fascination with interactive technologies is, in fact, part of the reaction against postmodern alienation, a nostalgic revival of the modernist quest for presence and immediacy” (1997, 125). Like #TAKEMEANYWHERE, I propose to create a work that gives a sense of immediacy, at least insofar as the audience would be working on something that is not old and done, but is instead still ongoing. And like #TAKEMEANYWHERE, I propose to create a work in which my creative activities will not stand in complete isolation from those of my audience members, and their creative work will not stand in isolation from each other’s, insofar as we will all be involved in collaborating on the same, common project. LaBeouf, Rönkkö & Turner have claimed that they see themselves as equal participants as the wider public that is involved (De Wacthter 2017, 220). I want to create the kind of collaborative artwork I have described in large part because I desire and value this sort of equality between artist and audience. Augusto Boal expresses worries that much theater – and much art in general – too substantially distinguishes between active, creative artists and passive, receptive audiences (Boal 1985). He worries that much of the time what passive audiences perceive and think might be unduly influenced by those who create. I believe that collaborative art, like that created by LaBeouf, Rönkkö & Turner, escapes from these concerns. Its audience members are active contributors and determiners of content. Åazim Jafarey writes that LaBeouf, Rönkkö & Turner are “humanizing the Internet as we know it” (Jafarey 2018). According to Jafarey, the three artists accomplish this in many ways, including actively engaging their audience – talking with the audience rather than just at them. This is the power I see collaborative art possessing. To create a work of art like I desire, it is not enough that I create I work of digital art that is published and yet incomplete. To create the kind of work that I desire, I would also need to create a work of art that is very different from those which are the focus of philosophers such as Lopes. Lopes claims that a work qualifies as computer art provided it is art that is interactive because it is run on a computer, such that its display changes in prescribed ways based on the actions of its users (2010, 27 & 37).7 As an example of computer art, Lopes describes Goldberg’s 1995-2004 project Telegarden, in which thousands of telegardeners around the world visited a website from which they could control robots to view and tend to a real garden in Austria (ibid., 22). But Lopes suggests that when audience members use a work of computer art like this, they do not also play the role of the artwork’s artists (ibid., 75). According to Lopes, audience members do not collaborate with the computer artist who originally published the work. Lopes claims that Levy, Krueger, and Ascott, whom I cited at the beginning of this article, are mistaken to see most computer art as involving artistic collaboration between the artist and the audience. Lopes treats most works of computer art as if they are complete at the time they are published in a gallery or online. Thus, as suggested before, members of the audience cannot make changes to the self-same work of art that its original artists began. So what exactly is the work of computer art that is complete at the time of publication, before most audience members see it? Lopes identifies a work of computer art as “the item whose varying displays come from the right computation process” – a computational process which is either: (1) run on equipment that was assembled by the artist or his designates; or (2) “implemented in code that’s written by its” artist, and runs on computers “at his blessing” (ibid., 66). Lopes then contends that since audience members of most computer artworks do not create the artwork’s computational process or its physical apparatus, those audience members do not play the role of computer artists, themselves. Audience members of most computer artworks do not contribute to the self-same works of art that their original artist began. Lopes draws a distinction between particular displays of a work of computer art and the work of computer art, itself (ibid., 60). He contends that just as Schoenberg’s 1949 Piano Concerto is an object of appreciation distinct from any individual performance of it, so too any given work of computer art is distinct from its displays (ibid., 57 & 60-61). And just as musical performances are tokens of musical works, so too computer art displays are tokens of computer artworks (2001, 65 & 71).8 Lopes argues that audience members, who play the role of users of a work of computer art, do not change, contribute to, or intentionally make the work of computer art, itself. Instead, those audience members merely make different displays, or tokens, of the artwork (2010, 75). But recall that I, as an artist, desire to create a work of computer art or a work of Internet art in which audience members really do contribute to the self-same work of art which I publish. Thus, the artwork I create would need to be very different from those on which Lopes focuses. Instead of creating an artwork like he describes, is it possible to create a work of computer art in which each new display that audience members create, as users, becomes a new part of the artwork, itself, and contributes to that artwork’s completion?10 If it is possible to create a work of computer art like this, then it is possible to create a work in which audience members would, when they play the role of users, also play the role of artists and collaborators. Lopes contends that, for an individual to be an artist of an artwork, the artwork would need to lack properties that it does in fact have if it were not for the actions of the individual (Lopes 2010, 72-74). In the artwork I desire to create, when audience members play the role of users, they would create parts of the artwork that would not otherwise exist, and so those audience members would also be artists of the artwork, as well. I contend that it is possible to create a work of art like this. To recognize why, it is valuable to recognize that a single work of art can be composed of many very different components. For example, it is easy to imagine a work of multimedia art in which an artist has paired a painting and a video, and both the painting and video are parts of the same single work of art. Likewise, it is possible to imagine a theatrical performance featuring, as central to its plot and themes, a set of new pieces of sculpture such that both sculpture and performance are parts of the same artwork. A single work of art can be composed of very different media. Now consider a published but incomplete work of functional computer art, such that its original artists intend for its users to add to it and contribute to its completion by creating new displays. By analogy, it should be possible for there to come to exist a single, complete work of art in which the project, as it was first published, is a part, and also all of its different displays are parts as well. Further, this single work of art would be, itself, a work of computer art, insofar as it would still be art that is interactive because it is run on a computer, such that its display changes in prescribed ways based on the actions of its users. To create a work of art like I desire, in which audience members really do contribute to the self-same work of art which I publish, I would need to create a work of art which has very different sorts of parts – a work of art composed both of what I began, and also of what each new audience member adds to it when that audience member plays the role of a user. Top image courtesy of LaBeouf, Rönkkö & Turner. Pointillist remixes by the author. To further clarify what the work of art I desire would be like, let us reflect on the relation between #INTRODUCTIONS and each of its remixes. We might think of each remix as being like a distinct display of an artwork which itself was created by LaBeouf, Rönkkö & Turner. The question, then, is whether that display – that remix – is a part of the self-same artwork which LaBeouf, Rönkkö & Turner began. If a new display – a new remix – which is created by audience members is also a new part of the self-same work instigated by the three artists, then those audience members would have contributed to LaBeouf, Rönkkö & Turner’s work as artists, themselves. Regardless of whether audience members really do contribute as artists to #INTRODUCTIONS, I contend that, in general, if an artwork is set-up the correct way, and if its artists and audience have the correct sorts of intentions, dispositions, and decisions, then a display an audience member creates could, in fact, be a part of the self-same work of art which the artists began. In fact, there might already be many cases in which audience members contribute as artists to an ongoing work of art. For examples, we might look to a number of instances of netprov, as well as alternate reality games. Mark C. Marino and Rob Wittig define a netprov as a “story that is transmedia, collaborative, and improvised (or partially so) in real time” (Marino and Wittig 2015). Sometimes, a core group of writer-actors, using a social media platform such as Twitter, will take on fictional roles and communicate with each other to create a narrative through dialogue (Burr 2015). Audience members can choose to participate, and interact with the core characters to influence the narrative that unfolds. Perhaps when they do, they contribute to the self-same work of art that the core group of writer-actors instigated but do not complete on their own. Depending on the artists’ and audience members’ intentions, it would be possible for any new content an audience member creates, which builds on the original artists’ work, to become part of the same artwork the original artists began, whether or not that new content could be considered a display of the original artists’ work. Content created by individuals who have never met, living in different cities and countries, might belong to the same artwork, much like a large number of separated dots or points might together make up a Pointillist painting. Stefan Sonvilla-Weiss compares digital mashups to Pointillist paintings (Sonvilla-Weiss 2010, 9). In a Pointillist painting, each point is separate from the rest, but together they constitute larger whole. Likewise, digital mashups involve an aggregation of different materials, each part of which can also be recognized as something unique and separate. Now I would like to imagine large artworks which also resemble Pointillist paintings, in which each new contribution an audience member makes is itself a part which contributes to an even greater whole, while still being separate and unique in its own right. I would like to imagine a large work in which each new contribution by audience members is like a separate point in a Pointillist painting; that is the kind of artwork I desire to make. To further clarify what this work of art I desire would be like, it would be valuable to distinguish it from the works of interactive computer art which Preston discusses. He notes that some works of computer art have an infinite number of possible displays, each with at least one set of structural and aesthetic properties. Sometimes, two different displays’ sets of structural and aesthetic properties are identical, as with some different displays of the same digital photograph, but sometimes different displays of the same work can have very different sets of properties, as with many works of interactive computer art. Preston provides a different account of computer artwork from that of Lopes, contending that each possible display’s set of structural and aesthetic properties is actually part of the computer artwork, itself, even if its users never actually make a display with those properties (2014, 271 & 275). He concludes that computer artworks would “possess all of the properties that their displays possess” (ibid., 275). I, myself, desire to create a work of interactive art in which the displays that users actually make, rather than just their sets of properties, become parts of the artwork once they are made. On Preston’s account, each time a user creates a new display, the user experiences part of a pre-existing work, since the display’s set(s) of structural and aesthetic properties already belonged to the work before the display was actually created (ibid., 276). In contrast, I propose to create a work of art in which, whenever an audience member creates a new display, that audience member adds a new part to a work that did not already include it. I leave open whether that new part’s properties already belonged to the artwork before the part belonged to it. Preston’s account of computer art might still be accurate, provided that, in some cases, actual displays themselves become parts of a work of computer artwork, once they are made, too. This article, itself, might be the first part of the kind of artwork I have in mind. But if it is, it would need your help, as its audience. I, its author, explicitly declare that this article is not a finished work. I have never decided that it is complete. Even after it is published, I will still intend to work on it and intend to have other artists and writers work on it, as well. I have no completion disposition with respect to this work. Further, I do not conceive of this work as being aesthetically complete or as having the qualities that would make it worthy to stand alone, as an object of intellectual appreciation. Instead, I request that you, as my audience, collaborate with me to complete this project, and to together finish a genetically complete work of art. I humbly request that you form the intention to collaborate with me to complete this artwork. Here is how you can help me to complete it: In one or more of your own articles, or alongside your own artworks, include notes which both cite this article and quote directly from it, and which also declare that your work belongs to the same larger artwork to which this article belongs. It is important to include a direct quotation, if only a short one, so that your work will involve both copying as well as original new content. I intend for any article or artwork with a note like this to be part of the same work of art to which this article also belongs. If you would be willing to help and collaborate, you would need to intend for your contribution to be part of the same work of art. I further intend that if I write articles or create artwork with notes like I have described, those articles or artworks would become part of the larger artwork I have in mind. I hope you will be willing to help me and collaborate! Here is the forward-looking completion procedure I have in mind: Any article or artwork with the appropriate sort of note will become part of the same artwork which I have begun with this article. I propose that the larger artwork I have begun here will be complete on January 1, 2118, no matter what that artwork is composed of at that time. Finally, recall that, to create the kind of artwork I desire, it would be valuable to create a work that appears incomplete, as if there are parts missing from it. This would give audience members a sense that there is more work to be done. That said, in order to finish describing the work of art I have in mind, there are still five more short arguments for me to discuss. First, it is very important, and absolutely central to this article as a whole, that . . . I greatly appreciate the help of Brendan O’Brien, who worked as my research assistant on this and several other projects. Thanks also to Michael Lewis, a colleague at Lynn University, who provided very helpful feedback in response to a draft. And thanks to my paper’s reviewers, as well as to Helen Burgess, the editor of Hyperrhiz, for thought-provoking, helpful feedback. I am likewise indebted to conversations with: Shia LaBeouf, Nastja Säde Rönkkö, Luke Turner, Caroline Peters, Kate Fox, Rachel Bewley, Katie Elson Anderson, Jay Winkleman, Jon Lawhead, and Daniel Estrada. Finally, I appreciate the help of Colorado State University-Pueblo, where, as a Visiting Assistant Professor, I invited Nastja Säde Rönkkö and Luke Turner to speak, hold an exhibition, and lead a workshop for students. Ascott, Roy. “Is There Love in the Telematic Embrace?” Art Journal 49, no. 3 (1990): 241-247. Bazzichelli, Tatiana. Networking: The Net As Artwork. Digital Aesthetics Research Center, 2006. Beardsley, Monroe C. “On the Creation of Art.” Journal of Aesthetics and Art Criticism 23, no. 3 (1965): 291-304. Boal, Augusto. Theatre of the Oppressed. New York: Theatre Communications Group, 1985. Burr, Lauren. “Bicycles, Bonfires and an Airport Apocalypse: The Poetics and Ethics of Netprov.” Hyperrhiz 11 (2015): http://hyperrhiz.io/hyperrhiz11/essays/bicycles-bonfires.html. Campanelli, Vito. “Toward a Remix Culture.” In The Routledge Companion To Remix Studies, edited by Eduardo Navas, Owen Gallagher, and Xtine Burroughs, 68-82. New York: Routledge, 2014. Corsa, Andrew J. “Metamodernist Genius: LaBeouf, Rönkkö & Turner.” Writersthoughts.com. 2015. http://www.writersthoughts.com/MetamodernistGenius/. Corsa, Andrew J. “#TribeLRT: Creative Essay on LaBeouf, Rönkkö & Turner's #TAKEMEANYWHERE.” 2017. http://www.takemethrough.com. Falconer, Rachel. “The New Polymath (Remixing Knowledge).” In The Routledge Companion To Remix Studies, edited by Eduardo Navas, Owen Gallagher, and Xtine Burroughs, 397-407. New York: Routledge, 2014. Hammel, Michael. “Towards a Yet Newer Laocoon. Or, What We Can Learn From Interacting with Computer Games.” In Digital Art History: A Subject in Transition, edited by Anna Bentkowska-Kafel, Trish Cashen and Hazel Gardiner, 56-64. Bristol, UK: Intellect Books, 2005. Hick, Darren Hudson. “A Reply to Livingston.” Journal of Aesthetics and Art Criticism 66, no. 4 (2008A): 395-398. Hick, Darren Hudson. “Authorship, Co-Authorship, and Multiple Authorship.” The Journal of Aesthetics and Art Criticism 72, no. 2 (2014): 147-156. Hick, Darren Hudson. “When Is a Work of Art Finished?” Journal of Aesthetics and Art Criticism 66, no. 1 (2008B): 67-76. Jafarey, Åazim. “Can Shia LaBeouf Save the Internet? LaBeouf, Rönkkö & Turner’s Blueprint for Meaningful Connections.” Medium. 2018. Accessed July 1, 2018. https://medium.com/@iseelucidly/can-shia-labeouf-save-the-internet-557c3d5a5cf8. Krueger, Myron W. Artificial Reality II. Reading, MA: Addison-Wesley, 1991. Levy, Pierre. “The Art of Cyberspace,” translated by Karin Lundell. In Electronic Culture: Technology and Visual Representation, edited by Timothy Druckrey, 366-367. New York: Aperture. 1996. Logie, John. “Peeling the Layers of the Onion: Authorship in Mashup and Remix Cultures.” In The Routledge Companion To Remix Studies, edited by Eduardo Navas, Owen Gallagher, and Xtine Burroughs, 296-308. New York: Routledge, 2014. Lopes, Dominic McIver. “The Ontology of Interactive Art.” Journal of Aesthetic Education 35, no. 4 (2001): 65-81. Lopes, Dominic McIver. A Philosophy of Computer Art. London and New York: Routledge, 2010. Livingston, Paisley. Art and Intention: A Philosophical Study. Oxford: Clarendon Press, 2005. Livingston, Paisley. “Counting Fragments, and Frenhofer’s Paradox.” British Journal of Aesthetics 39, no. 1 (1999): 14-23. Livingston, Paisley. “On Authorship and Collaboration.” Journal of Aesthetics and Art Criticism 69, no. 2 (2011): 221-225. Livingston, Paisley. “When a Work is Finished: A Reply to Darren Hudson Hick.” Journal of Aesthetics and Art Criticism 66, no. 4 (2008): 393-395. Livingston, Paisley and Carol Archer. “Artistic Collaboration and the Completion of Works of Art.” British Journal of Aesthetics 50, no. 4 (2010): 439-455. Preston, Dominic. “Some Ontology of Interactive Art.” Philosophy & Technology 27 (2014): 267-278. Rothman, Roger. “Fluxus, or the Work of Art in the Age of Information.” Sympokē 23, nos. 1-2 (2015): 309-325. Saltz, David Z. “The Art of Interaction: Interactivity, Performativity, and Computers.” Journal of Aesthetics and Art Criticism 55, no. 2 (1997): 117-127. Sonvilla-Weiss, Stefan. “Introduction: Mashups, Remix Practices and the Recombination of Existing Digital Content.” In Mashup Cultures, edited by Stefan Sovilla-Weiss, 8-23. Vienna, Austria: Springer, 2010. Tavinor, Grant. “Video Games as Mass Art.” Contemporary Aesthetics 6 (2008): https://contempaesthetics.org/newvolume/pages/article.php?articleID=616. Trogdon, Kelly and Paisley Livingston. “The Complete Work.” Journal of Aesthetics and Art Criticism 72, no. 3 (2014): 227-233. VICE Staff. “For the Next 30 Days You Can Take LaBeouf, Rönkkö & Turner Anywhere You Want.” VICE.com. 2016. Accessed June 14, 2018. https://www.vice.com/en_us/article/mvkaxn/shia-labeouf-take-me-anywhere. De Wachter, Ellen Mara. Co-Art: Artists on Creative Collaboration. Phaidon Press, 2017. The script for the motivational speech video was authored in large part by artist and Central Saint Martins student, Joshua Parker. I have extensively discussed the relation between original and unoriginal content in the work of LaBeouf, Rönkkö, Turner in a creative, non-academic essay; see Corsa, 2015. This is also Hick’s approach to reading Beardsley. See: Hick 2008B, 67-68. Hick (2014) and Livingston (2005), both alone and with Archer (2010), have also suggested that to be an author of an entire work, an individual would need to possess a sufficient degree of control over the work and a sufficient degree of responsibility for its content. I have extensively discussed the communities created by #TAKEMEANYWHERE in a creative, non-academic essay; see Corsa, 2017. For a related discussion of original versus unoriginal content, see Corsa, 2015. Lopes adds that a work is “strongly interactive,” like the central examples of computer art on which he focuses in his book, when its users’ actions shape its structural properties, namely the “intrinsic or representational properties it has the apprehension of which are necessary for aesthetic engagement with it” (2001, 68). Lopez notes that we also consider each playing of a game, such as chess, as a token of the type of game that is chess, even if each playing is radically different. So, he suggests, different displays of a computer artwork can likewise all be tokens of the same artwork even if they have very different “state-sequences” (2001, 75-76). For a related type/token account, see: Tavinor (2008). Roger Rothman discusses Fluxus Kits, which artists would create and sell to others, which included directions like this: “They included things like Robert Watt’s rocks and George Brecht’s Inclined Plane Puzzle (a box with a small ball inside along with the instructions to ‘Place ball on inclined surface. Observe the ball rolling uphill’)” (Rothman 2015, 312). Following Preston’s example, I use the term “‘part’ in a mereological sense, i.e. with no ontological restrictions, to avoid any implication of all artworks having to be physical objects” (2014, 275n14). Andrew J. Corsa holds a Ph.D. in Philosophy and is an Assistant Professor in Lynn University’s Dialogues of Learning program. In addition to writing articles focusing on the History of Moral and Political Philosophy, he has also written several non-academic, creative essays about the artistic work of LaBeouf, Rönkkö & Turner, which can be found here and here.